The XP80 is the latest “rugged” camera from Fujifilm, which boasts waterproofing down to 15 metres, shock proofing from 1.75m, freeze proofing down to -10 degrees Celsius as well as dust and sandproofing. It is designed as a family and adventure camera, perfect for those who like to take pictures in all kinds of different conditions. The Fujifilm FinePix XP80 also boasts a 16.4 million pixel 1/2.3 inch BSI-CMOS sensor and a 5x optical zoom, which is 28mm at the wide angle. Along with those specifications, there is also inbuilt Wi-Fi for remote shooting, 11 advanced digital filters, and a 2.7 inch LCD screen with anti-reflective coating. Full HD video recording is also available. 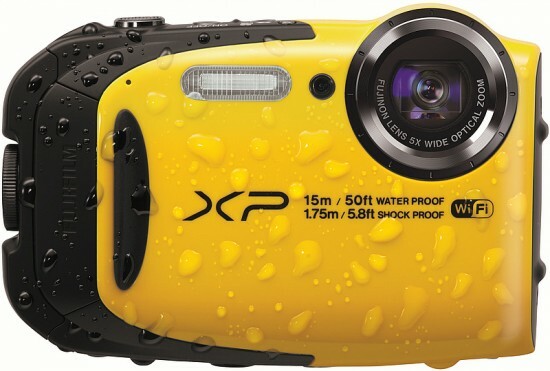 The Fujifilm FinePix XP80 is available in black, blue, yellow and purple for around £200 / $230. Fujifilm has been using a very similar design for all of its rugged cameras for some time, and the XP80 is no different. 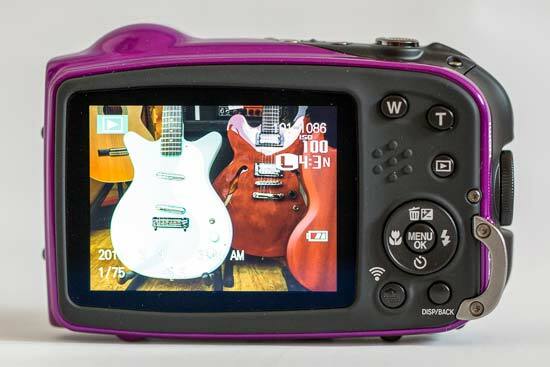 The camera has rounded, curved edges and it’s available in a variety of different colours - including the vibrant purple which Fujifilm sent us for this review. The lens itself, which is encased entirely within the camera so as to be waterproof, sticks out a little from the top of the camera in a rounded shape. 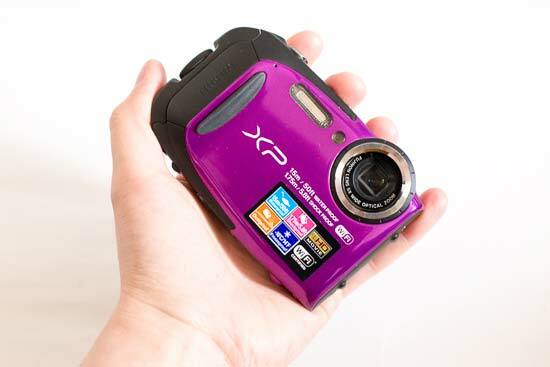 On the front of the Fujifilm FinePix XP80 is a ridge for your finger to sit comfortably and to help you grip it. If you’re using the camera with gloves it may be less useful as it doesn’t protrude too far from the front of the camera. The side of the Fujifilm FinePix XP80is the only entry point for the camera, with the rest of it sealed and encased for watertightness. In the side of the camera you’ll find the memory card slot (for SD cards) and the socket for a power cable, as well as the battery. These are protected by a door which is sealed by a twisting mechanism which you need to turn to release. It’s reasonably unlikely that you would be able to do this by accident, as you need to push down a button in the middle of the lock in order to twist it. Charging the battery is done via the body of the camera itself, and a separate charger is not provided. However, it doesn’t take too long for the battery to charge up - that said, if you think you’re going to be taking lots of shots before you are able to charge it again, it would be worth investing in a second battery. There are quite a few buttons on the Fujifilm FinePix XP80, all of which can be reached very easily with your thumb when holding the camera in your right hand. This makes it very easy to use one handed. 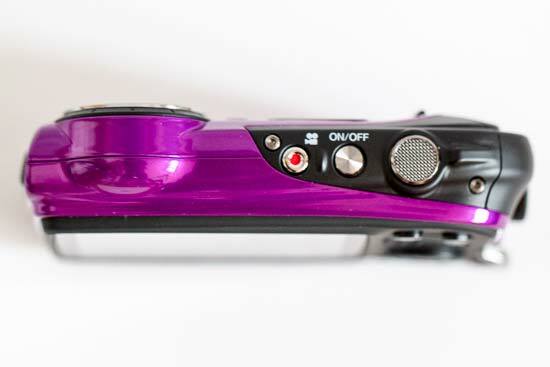 On top of the camera is the on/off button, video record button and the shutter release button. The shutter release button is textured and fairly large, which comes in handy when you’re using the camera either with gloves, or underwater. You’ll find the rest of the camera’s buttons on the back right of the camera. Near the top of the camera are the zoom buttons, which are marked W (wide) and T (telephoto). These are raised from the body of the camera, again to make it easy to use when working underwater or with gloves. In normal conditions, the buttons can be a little stiff to use, but holding them down advances or retracts the zoom fairly smoothly and swiftly. A small playback button can be found just underneath the telephoto button, which is fine to use in normal circumstances, but a little more fiddly with gloves on. Just underneath this button you’ll find a standard four way navigational pad, which again is a little small and fiddly to use with gloves on. If you’re just using it underwater, it’s not too bad though. The pad consists of a menu/OK button in the middle of the pad, surrounded by four directional keys which double up to other specific functions: left for macro/standard focusing, down for timer options, up for exposure compensation (and delete in playback) and right for flash options. The final two buttons you’ll find are a direct access button for Wi-Fi functionality or continuous shooting and a display button which allows you to switch between different types of display in playback, or acts as the back button when scrolling through the menu. Speaking of the menu, this is where you’ll need to make any key settings changes that aren’t already covered by the directional pad. In this menu is also where you’ll find the different exposure modes available to you. It’s likely that for the majority of the time that you’ll want to shoot in Scene Recognition Auto as this will mean that the camera will automatically pick a scene mode and apply the best settings. However, if you want to take a little more control it’s possible to switch to Program Mode. While this doesn’t give you quite the same flexibility of manual control, it means some settings, such as ISO sensitivity can be changed. Other exposure modes include the advanced digital filters if you want to experiment with the way your images look, and different specific scene modes, such as underwater, landscape and panorama. It’s a little laborious having to go through the menu system to make some of these changes, so it would have been nice if a quick access button could have been included on the Fujifilm FinePix XP80. That said, this camera is all about taking pictures and concentrating on composition etc, rather than worrying about changing settings very frequently. On the other hand, the menu system itself is fairly straightforward, and with relatively few options on offer, it doesn’t take too long to get acquainted with using it. There’s a shooting menu as well as settings menu, where you’ll find options including setting the date/time, silent mode, formatting the memory card and so on. 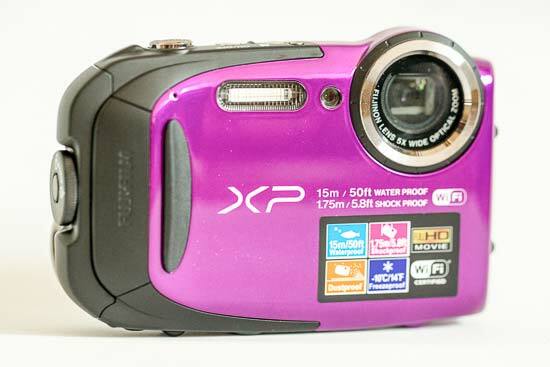 Using the Fujifilm FinePix XP80’s Wi-Fi functionality is very easy. You have a couple of options - you can either use your phone/tablet as a remote control for the camera - which is great for selfies, group portraits and just awkward angles, or you can send image(s) you’ve already taken across to your phone for sharing on social networks and the like. When you’re using the remote control app, you can’t change too many of the settings, aside from switching on the flash, the self-timer or extending or retracting the zoom. You can take both stills and video from within the app. The LCD screen on the rear of the Fujifilm FinePix XP80 is relatively small in comparison to most standard compact cameras, but never the less it provides a bright and clear view of the screen. If you’re shooting underwater, but you are not underwater yourself (say for instance you’ve plunged your hands into a rock pool), it can be a little difficult to see what’s on the screen from some angles, but that’s understandable.